AUCKLAND, NEW ZEALAND – 10 October 2018 – Kiwi software development company, Sylo, is partnering with global blockchain venture studio, Centrality. Sylo’s decentralised application (DApp) and communications and storage protocol will become the toolkit and user-access point for the Centrality ecosystem. Sylo’s innovative peer-to-peer confidential communication application has already gained global user adoption. It forms the foundation of a fully decentralised application that will launch in Beta by the end of 2018. The two have joined forces to realise their shared vision of a decentralised future. Sylo will leverage Centrality’s extensive international network of relationships. Centrality will strengthen its offering with Sylo’s feature-rich end-user application. The Sylo-Centrality partnership will provide communication, storage, identity, exchange, payment rails and big data services. Sylo Co-Founder and Product Director Ben Jordan says that the partnership with Centrality brings the opportunity for Sylo to get alongside other companies in the ecosystem and open up its decentralised communication and storage network to be used within other DApps. “The value of blockchain is realised when those in the chain come together to provide people with seamless and secure experiences, whether they’re communicating or transacting peer-to-peer. Working with Centrality will help Sylo make that a reality,” says Jordan. Centrality brings significant scale and resources to the table, enabling Sylo to increase its global reach. Sylo is already working with a number of companies within the Centrality ecosystem, covering areas such as transportation, real estate, provenance tracking, artificial intelligence and more. These collaborations will demonstrate capacity to build and sustain the long-term value of Sylo tokens. 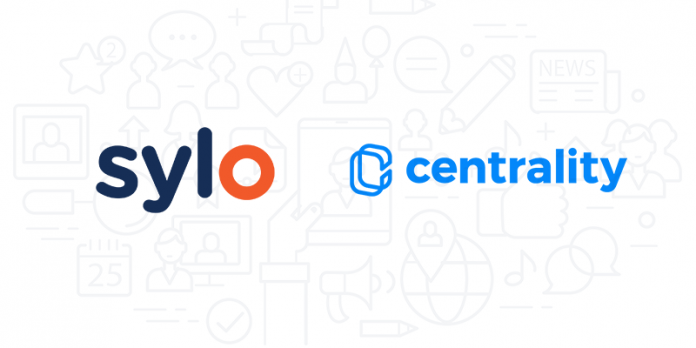 “Our partnership with Centrality allows our vision for the Sylo application to become even bigger. We can now operate with a range of different companies and bring all of those functional benefits to Sylo users and beyond,” says Sylo Co-Founder and Business Director Dorian Johannink. For further information, please contact Sylo – Anabela Rea (anabela@sylo.io) +64 21 0232 4493 or Centrality – Fred Russo (fredr@botica.co.nz) +64 21 403 509. For further announcements about the partnership, please follow Sylo on Telegram, Facebook and Twitter, or visit its website at www.sylo.io. Sylo is a decentralised communication application and protocol, which enables users and businesses to interact online under the same terms as they currently can face to face. The Sylo decentralised application (DApp) offers confidential voice, video calling, messaging, storage, address book, token wallet, and access to other connected DApps in order to provide users with a feature-rich experience that translates into real life value. Centrality is a blockchain venture studio that partners with innovators in key industries to create a decentralised peer-to-peer marketplace of applications. Through its platform, consumers can manage everyday tasks and experiences through a blockchain-enabled peer-to-peer infrastructure. Centrality has a growing portfolio with over twenty applications, each working and generating value independently, as well as enabling growth for one another. With a team spanning Auckland, London, Melbourne, and Singapore, Centrality is equipped to support its customers around the globe in the transition to a blockchain-enabled future worldwide.